Posted March 31, 2010 under Ask the Mediatrician. Q: My husband and I want to model good media habits, but we have trouble disconnecting because we are self-employed and use social media for our work. Do you have any practical tips for how to step back from technology in this situation? How long should my 3-year-old play with iPhone apps? 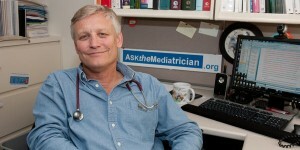 Posted March 17, 2010 under Ask the Mediatrician. Q: My 3 year old son can spend hours playing with the PBS kids iPhone app but how long should he spend using it? Should I take my kids to see Alice in Wonderland? Posted March 11, 2010 under Ask the Mediatrician. Q: Is the new Alice in Wonderland movie too scary for kids? How can I talk to my pediatricians about the TV screens in their waiting room? Posted March 10, 2010 under Ask the Mediatrician. Q: My pediatrician’s office plays Disney movies in their waiting room and my child was scared by one of the movies he saw. How can I talk to the doctors about monitoring what they show on their TV screens? How are toys marketed differently to boys and girls? Posted March 8, 2010 under Ask the Mediatrician. Q: Can you tell me more about how toys get marketed differently to boys and to girls?